"The VRDB job board reaches top upcoming developers. Artists and programmers who have gone above and beyond other graduates by applying themselves in the real world and creating indie games and mods which demonstrate their ability and initiative." Why recruit a beginner to game design when you can recruit a modder. Someone who has worked with the engine, tools and hardware you use to build your games. Hire experienced developers who understand the challenges you face without the need for costly training. Modders deal with language barriers, timezones, big teams, deadlines and many of the issues facing your game development project. And they manage these complexities without a budget and access to the latest technology and training. Modders jump in at the deep end. Each month, job ads on VRDB are shown to over half a million people. You can post on a faceless job site and receive a deluge of unqualified applicants, or you can find people who are dedicated and passionate about game design and determined to explore their creative ability. 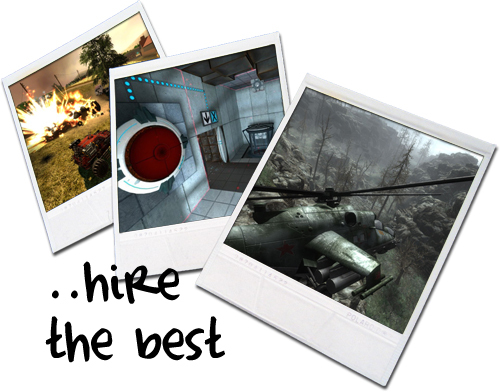 Hire now.